Love and marriage go together like .... my folks. 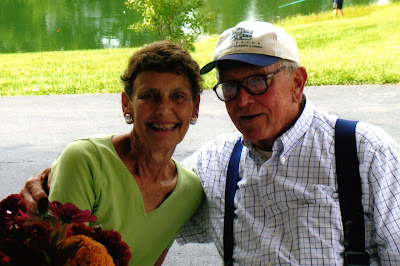 They just celebrated their Sixtieth Anniversary. They are my parents and they are truly two of the most amazing people in my life. Strength, compassion, hard work, and love, have carried them through life with amazing grace. Through better and worse, they have always made the best of it. For richer or poorer, they have always been grateful for all they have, sharing simple goodness from the heart. 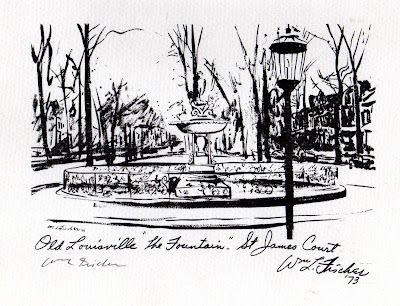 My father raised on a a farm, one of nine and my Mom, one of four - grew up in the city of Louisville. They have remained Kentuckians their entire life, born and bred. I am one of the lucky seven children. As a mom, I am in awe of anyone with that many children and that many years of love and marriage. It is not for the weak nor the timid. The best thing about my parents is their positive outlook. They both look in the same direction - that is when they are not looking at one another. Now that is what I call true love. You know the type, the one that is ever so humble. The above humble abode welcomes you after a long day. The path guides you and grounds you. A patch of earth to work, a table to sit and break bread, a bath tub to bathe a baby and a light to see the love lit from within each night. It takes a heap of liven to really make a house a home. 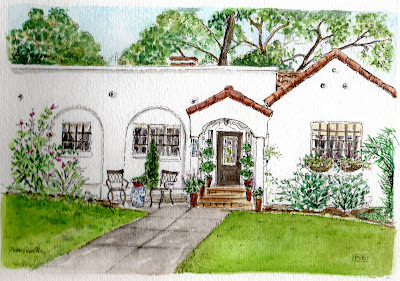 I am so impressed by so many homes that come across my path. I am ever so humbled to capture my vision in an original and personalized art. Thank you, I am grateful! 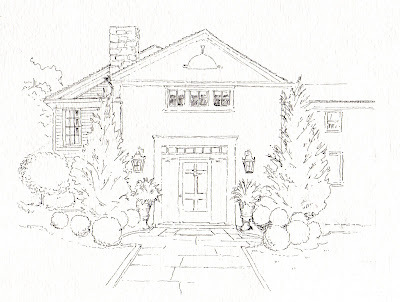 This is a recent sketch that I am working on - for a client. 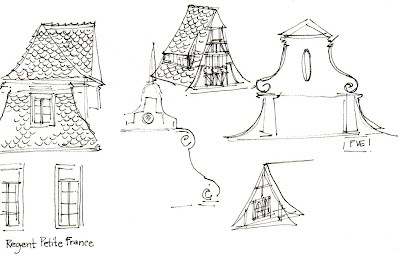 I begin by drawing fine lines to form the shapes in pencil. Step 2 is to use a micron pen ever so lightly and then add a wash of color. I "look" then draw and "look" some more until I feel that I have captured it. I often give myself a time limit as drawing takes a looser approach rather than one that was belabored for hours. For me, my artwork after all is a true labor of love. Now off to do the fill in with the water color wash! Can hardly wait. Do drop me a line and tell me how you go about creating your work. Pink sand reminds me to think happy thoughts and to remember a special "Mother-Daughter" trip to Bermuda. At the time I was expecting my third child and my Mom was going to be a Grandmother for the 11th time. 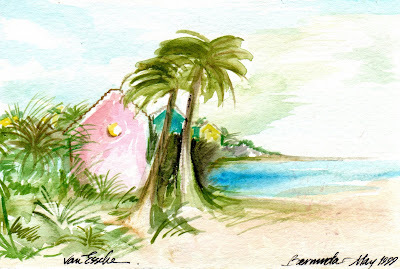 While we were there, I painted these scenes on the beach. 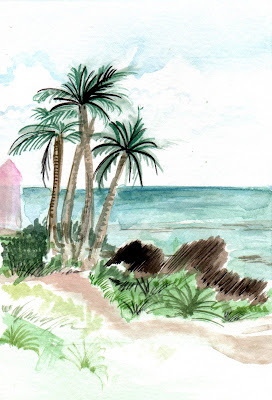 I always travel with paper and my paints to make my own postcards. Pink is a color that stands for beauty, grace and goodness. Try wearing a little pink or painting something pink and see how it brings hope to your life. Surround yourself with pink. Think of all the things your own that are pink and feel your spirits lifted! School has not begun here, but for many across to nation, school is in session. For Fall, my thoughts turn to having an organized bag. Call me old fashioned, I need a calendar to write on or to make notes, tissues, a pen or two, lip stick or gloss, wallet, glasses & case, cell phone and a clip to gather papers or a small box for receipts. What's in your bag for school? Thank-you to each of you for keeping my son in your thoughts - we are in hopes that he will be back on his feet and home soon. He will be out of commission for sports for a while and will not be able to begin school next week. You cannot imagine how grateful I am for your comments, your smiles and your positivity. One of the main reasons I love being an artist is tapping into my intuition. Women have the ability to sense when something is not right or when something needs more attention. 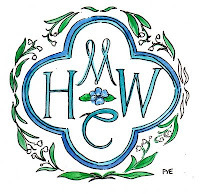 My postings shall be a bit scattered as my son is recovering from an emergency surgery and I have been looking for answers to his pain all week. Alas, he is in excellent care and his mother's intuition was correct. Trust your intuition when you create or inspire someone to look a little further. Often we are faced with situations that cause us to delve a little deeper to find the answer that was there all along. Just knowing that so many of you are thinking of me and my son gives me solace. At ease on the floor. All a sweet memory this faithful companion. She sent me for a virtual "white treatment." Nothing forced or pretentious - just fresh white to make it all right. 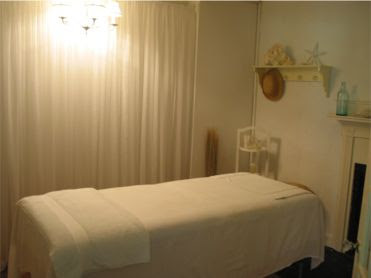 A massage is always good for taking one away from the daily hum drum. The masseuse inquires, "And what will we be working on today?" I reply, I need the swedish massage, the one that works out all the knots and knarls - you see, I have spent too much time in a hospital and the emergency room in the past week. Not for me, but for my most valued sons - one had an elective surgery and the other a horrible virus. Both on the mend. This would have been the perfect waiting room for me. I have figured out what is ailing our health care industry. Have you seen the horrible furniture and the lighting in our Hospitals?Hospitals need designers to infuse feel good waiting rooms and hospital rooms. Two of my favorite childhood characters, "Curious George" and "Madeline" both making trips to the hospital were always inspiring to me. But reality is that todays hospitals are enough to make one run away and hide. If only there were these chairs like this -in the waiting room, they are calling me. Come sit and we will comfort you. I am feeling so much better and like I said, I am not even sick. No, I am never supposed to say that, because that is the jinx of it for me now. Anyway, just thinking about this cottage makes me want to get away. I would return and friends would say, "Dahling, you look fabulous" - and I would reply, it is a new treatment, "the white treatment." 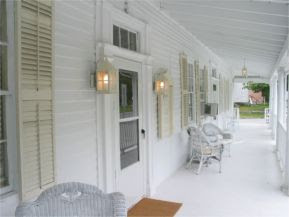 Just a few days spent in an all white cottage and I feel cleansed. 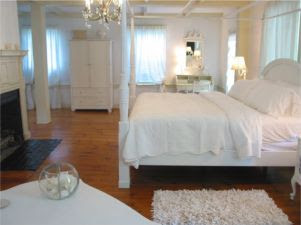 Nothing like white to cleanse the palette, spirit and soul for a heavenly bit of rest and relaxation. Ready to go back to reality and face the infirmary at my place. I can already predict those of you that would want to book a "white treatment." Welcome red - painted by my sister. She sent this scan to me and I just had to share this. So many things that I love about this work, the shadow cast meeting that potted fern and the sliver of the shutter leading my eye up to those hanging lanterns. 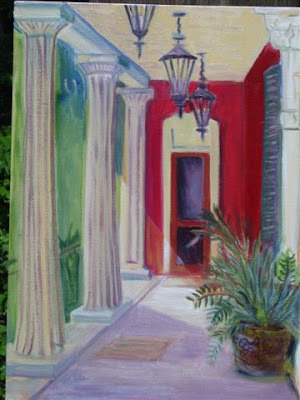 This makes me think of the South and grand entryways and steamy hot summer afternoons and ice tea with lots of sugar and fresh mint. It is for sale should you be interested. Hurry, I may buy it first. Today my youngest child is nine and very fine. Just last night at dinner, my then eight year old, said, "Only 4 more hours til I am nine - but I wish I were ten!" 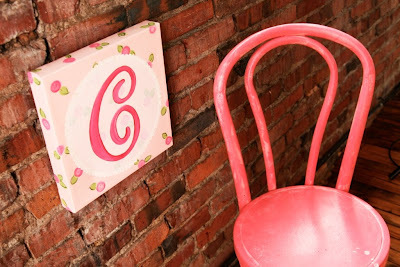 I being the mother who must look for the good in all, yes, but "Nine is fine and did you know that the chinese love the number 9, for it is powerful and very lucky!" 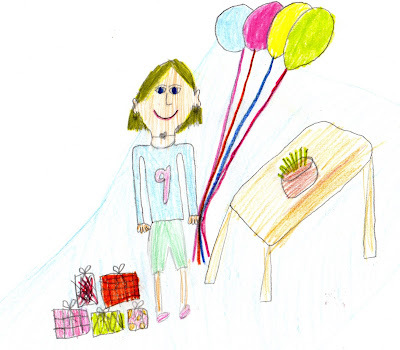 This morning - she drew this sweet drawing for me and we are planning to go have a special lunch out with her big brothers and this evening are the Swim Team Awards for a great summer season! This is her third summer on the swim team and making it to the Westchester County Finals! We also have a concert in our local park which are always fun. It is the type of place where everybody knows your name. (I know the lead singer and am in hopes he will sing a special song!) Life at nine is very fine. As her swim coach says, "I mean really, can it be any better than this?" Happy Birthday number three to being nine! We all know the phrase, "Sticks and stones will break my bones, and words will never hurt me" is so not true. Even the smallest words can hurt but I would like to focus on some very powerful small words that you can shop for here. 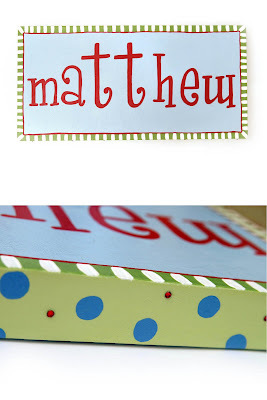 What's in a name or even a "letter" is after all - mighty powerful and you can have your very own name or perhaps a name for someone you love painted in a fun fresh way! Connecting with other Moms who are juggling family and work is all incredibly inspiring to me. I always want to know their story and how they do it. For most, it all began with the birth of that first child and wanting to be there, so most work-at-home Moms look for something to do from home or perhaps are pushed by friends. We all need someone to blame for our success, right? 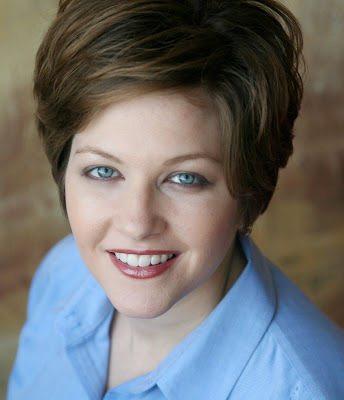 Meet Kim, she is the driving and painting force behind this bright and cheery company. She had never painted before and did not even know what a "filbert" was. For those of you that do not know, it is a type of artist's paint-brush, with a certain type of the bristles and yes, it is a nut too. 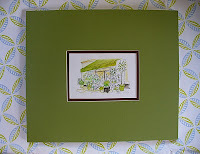 Kim also keeps a blog too in the midst of painting and potty training. All 4 of her children are in diapers. I hope that is not TMI! (too much information) There is nothing this Mom can't do and she certainly does it with style and grace. Please visit Kim and leave her with a small word of advice, not that she needs any! 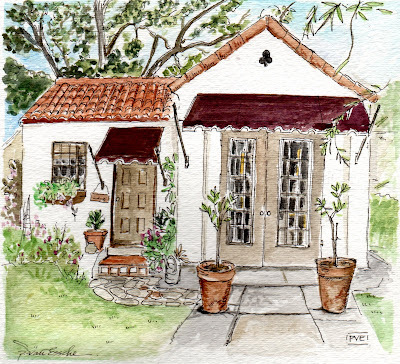 A cottage to use as an Artist Studio, a game room, a party room or a Library. 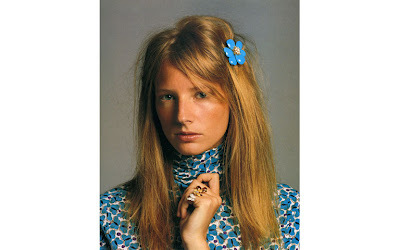 The above cottage belongs to this woman of style. This is the home of Topsy Turvy Style. I was expecting a bit of chaos as the name implies but I have looked closely while illustrating this idyllic spot. 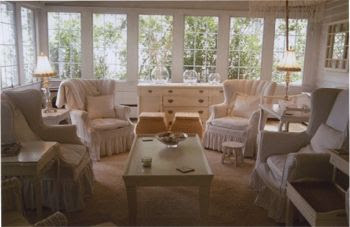 This is the home, one of a "twin" home designed by Architect, Dwight Baum. As they say we all have a "twin" somewhere. 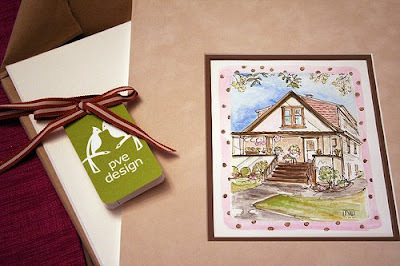 Lana posted about pve design and my love for illustrating life on paper ranging from homes, shoppes to pets, parties to basically whatever your heart desires. When she posted her very own home, I took it as a sign to capture this special spot for her. Thank you for posting about me. I am so grateful for all of the support and motivation from the blogging community. A traveling sketch book comes with me on all my travels. 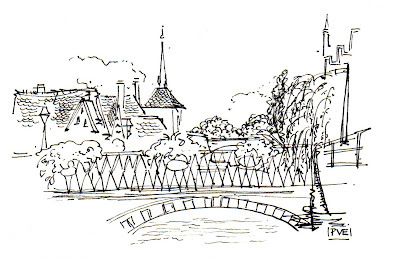 While we were in Strasbourg, France I enjoyed sketching this scene while we were on a boat on the canal. 1 container for holding water w/lid. My traveling sketchbook helps me to "look" and to really appreciate the sights around me and the ability to take time and sketch what I see. Simply sketching with a black micron in a black bound mole skin sketch book takes me traveling - even when the trip is over and I am back home. 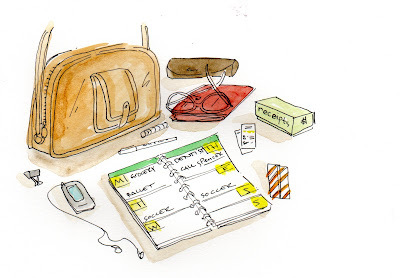 Do you travel with a journal or a sketchbook? Try it and you will be amazed at how much joy it will bring you. Besides, I always meet people who tell me "Oh, I can't even draw a stick figure" - and I reply, "Well, I am so glad that I inspired you to start today!" I always tell my children or students that I teach art to, "getting started is half the battle, so start now!" I came across this gal while on NPR and just had the best laugh. 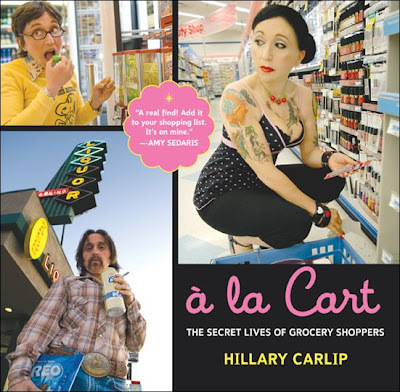 Hilary Carlip has written a book, a la carte book containing "memoirs" based on found "shopping lists." She even goes so far as to dress to match the list. One list was written on the inside of a matchbook, "oreos" and "coors" which I found pretty funny. Do you shop with lists and what does your list say about you. I can already imagine what some of your lists must look like. If Ms. Carlip found yours, what would she find and how would she portray you? Care to share? We were both in a hurry and it was a bad connection. Darn cell phone. It was my mistake. I had asked a reliable source for a nice spot to stay and she said "breathe in" and I thought she said "breeze inn" and that was that. I booked a very different spot for what we thought would be a nice weekend get-away and instead it was not. We should have stayed at "here." When you see the site, it is so inviting and so refreshing too. 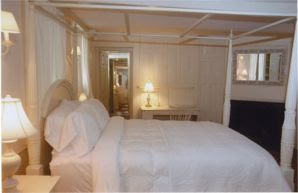 If I were an inn keeper, I would have fresh flowers, fruit, the whitest towels and artfully inspired rooms with beautiful art and books. I would provide spots to relax and healthy cuisine. It would be just like this one. 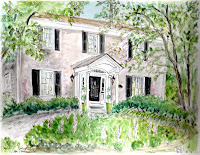 I would illustrate my Inn like this one too. Care to share, what do you do if you arrive and realize that the place is really not commensurate with the web-site. Do you stay or do you go? I shall take this as a reminder to slow down and to breathe in. 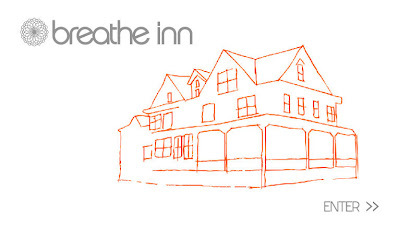 Next time we will stay at the Breathe Inn. 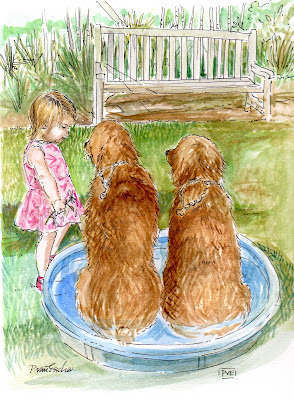 This illustration was done for a fellow blogger who spotted my "pet story" post and sent me some photos of her little one with these dogs enjoying a summer day. "Ain't life grand!" "Nope, ya can't get in the pool now, not til Mom comes back from the store and besides there is not enough room in here for the three of us." Black and white has always appealed to me for many reasons; the quality of the line, the positive negative use of space and the simplicity that subjects are captured in a relatively quick and timeless fashion. Attending art fairs has always appealed to me too. As a teen, an annual pilgrimage to the "St. James" Art Fair, in Louisville, Kentucky where I would see a variety of hand crafted items from paintings, macrame, stained glass, beaded necklaces, and pottery. Could you tell it was the 70's. 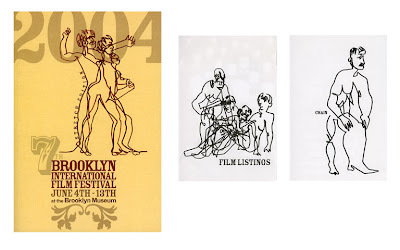 A flood of memories of those days of how impressed I was with artists and their ability to express themselves in art. I always knew that is why I wanted to become an artist. I still love to attend art fairs and am in awe of the way that art fairs have their finger on the pulse of introducing new artists. Artists are always seeking ways to be noticed and to more importantly sell their work. An Art Fair is a wonderful venue for showing work and for meeting other artists. 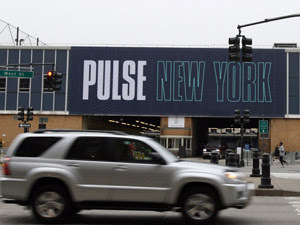 Do you attend Art Fairs? Tell us what you saw and if you made any purchases. 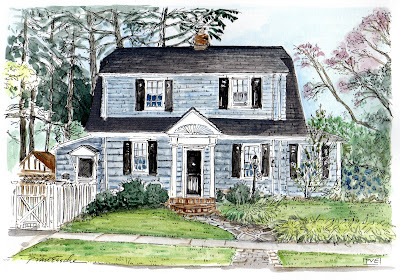 Coming home to a welcome mat or a perfectly matted custom illustration of your home is the perfect way to begin the day. All of my illustrations are finished with a hand selected matte with the assistance of an expert local framer who always knows how to accent my artwork. The arrival of your artwork not only ships better, but then it is ready to frame - but alas, the framing may also be done for you too. The above artwork for Making it Lovely was matted in a buttery suede matte which really added to the warmth of this lovely home. I love to see what exciting things Nicole is doing to her home or hear about her business. A custom cut mat brings new meaning to " welcome mat", something soft and sophisticated to come home to. Does your home have a welcome mat or is that something on your list? Just the other day, my daughter came running to me as we were on our way from the parking lot to our pool club, "Mommy, look what I found!" Lo and behold, a lovely plume from a peacock. I had to think, I have never seen a peacock around here. Like I have said before, my life is dedicated to create and to inspire an artful life and perhaps there is a larger, grander plan for me, sort of like that story, "chicken little the sky is falling." 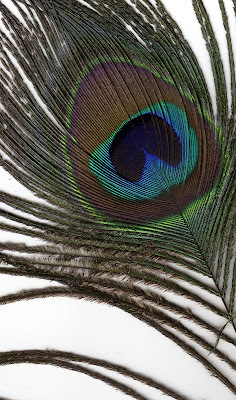 This time it is "peacock feathers!" 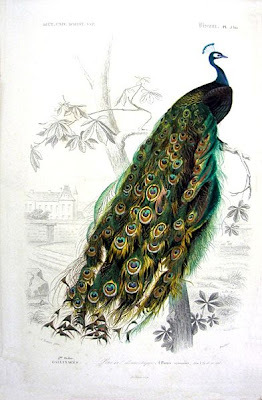 Whenever I see a peacock, I cannot be help to think how the feathers they drag behind look like that of a train on a haute-couture dress or that of a wedding dress. If you have ever worn a dress with a train, there is a certain elegance and a weight that controls your movement to a regal promenade, similar to that of a peacock train of feathers. It feels like that of a custom weighted drape that spills on the floor, sweeping up puddles. What a gorgeous creature with a dressmaker train, designed by nature. Look at this stunning peacock, how happy was I when he posed for the photo when we were in Florida a few years ago. I must admit that peacock blue is electric. For Fall I am looking for yarn to knit something for my neck, a scarf, or perhaps a long necked sweater in some brilliant shade of "peacock blue." 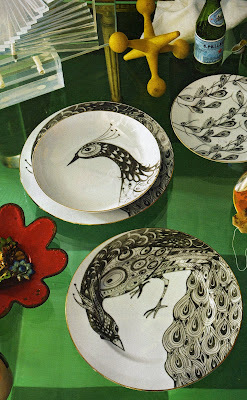 I would wear it while having a cup of tea, and eating apricots and fresh figs on this dinnerware found in the Anthropology catalogue. For only twenty dollars, I can have a dinner plate or a bowl for $16 for my morning cereal which would certainly make for an elegant start to my day. Like I have said, Inspiration comes in many forms and I hope that you take time to look for the clues which are often found, stepped upon or fall from the sky. Owning a pet provides a companion, one to care for, to walk, to feed, to love and to tell stories through many adventures. 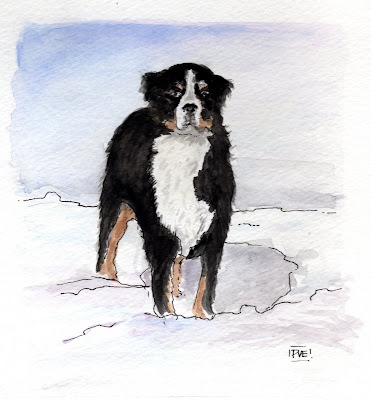 A pet also tells of a time and a place and makes a memory. As a child, I watched "Lassie" and had a dog name "Snoopy." Lucky me. 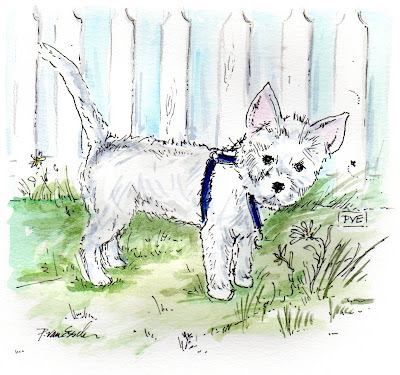 One such lucky fellow is a Westie name "Winston" and his Master tells tales here. I always enjoy reading the latest scoop! 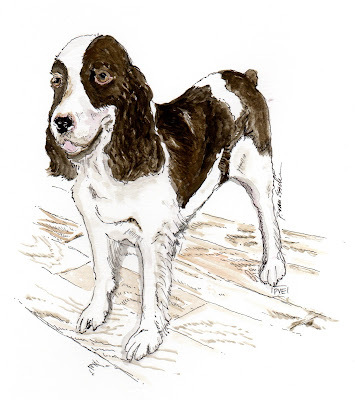 Another lucky four legged friend, "Monty" illustrated below has quite the life of Riley! 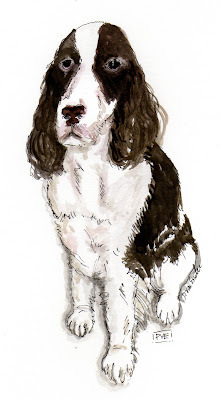 If you do not know Monty already, click here, after all it is "Monty Monday!" You may follow the exciting adventures of this handsome lad. I adore his name and his sleek physique. If you own a pet, no doubt you have a "pet story." Never have I met a pet without some sort of story or adventure. The first time they touched "grass" or "snow" or "sand"-and the first time they got a "tick" or were "sick." 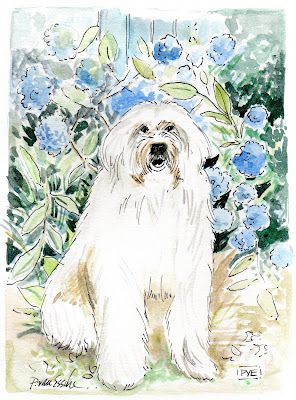 The first time I met "Bobool" - my husbands childhood dog in France, I must admit, I was (un peu- in french means, a little) nervous because of the stories I had heard. "If Bobool likes you, you are in" -- he would retort. Great, (I thought) to think that it all came down to the likability of a "dog and I." It is true how a pet can immediately be your friend or foe. My brother has three dogs and when he came to visit, my dog, "Bentley" would not stop barking at him. It took threes days before he warmed up to my brother. Training and teaching a pet can be quite a challenge, "repetition is after all the mother of learning." 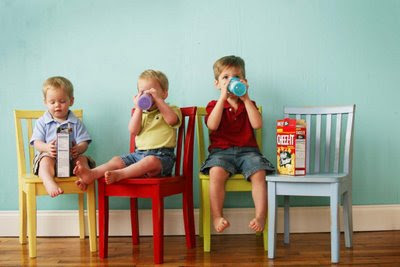 Many commands repeated, sit, down, stay, come, are all rewarded when done with finesse. They say that the dog needs to hear his or her name repeatedly and that "2" syllable names work best. I did meet a Yorkie named "Hercules." Giving a little dog a "big" name surely will relieve any future pet insecurities which might lead to "pet therapy!" 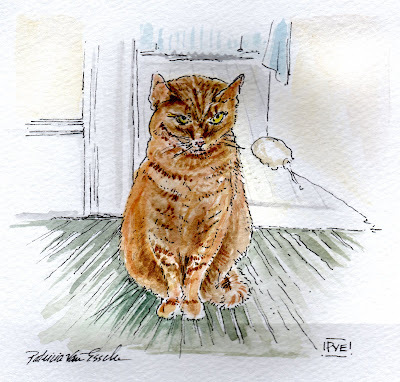 Recently, I phoned a friend who was just on her way to take her cat to be "put down" and she was crying, a twelve year pet story to tell or to paint. Never easy to lose a pet after so many years and so many stories. Do you have a pet story? 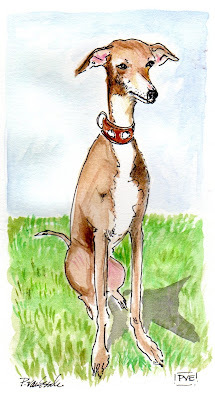 Love to hear your pet story or illustrate your pet for you! It is Sunday and we could all use a little grace in our day. Grace is an illustrator, model, photographer. What an amazing life she lives. Here she is in Black and white, which is always elegant and timeless. Here she is in full color, surrounded be these handsome young things. I love the way her hair is styled. Just goes to show that it is all about the hair. Golden hi-lights and golden girls need a little gold. 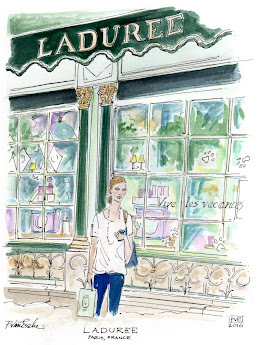 Grace infuses an element of "heart" in her linear illustrations. I heart them. 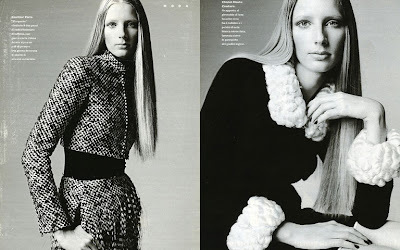 In these shots, Grace reminds me of the legendary model "Veruschka." She had a penchant for leaping like a gazelle and her long mane of straight hair ,elongated her height. I think most importantly, a loud and clear message is to make your life beautiful, meaningful and unique. This seems to be a natural for this gal as she works as a model, an illustrator, a photographer and a unique individual. See her here. After all - Sunday is a day for giving Grace and for not working, right. Let's hope and pray that Grace is resting today, Sunday. 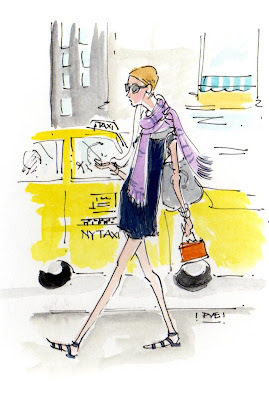 Spotting mufflers worn on one of the hottest days of Summer in NY City, I decided to draw this chic gal, sporting a simple shift, a gladiator sandal, slouchy summer bag, tunes and a "muffler." Could it be that the shops, offices all blast the cool air conditioning which requires for a scarf to provide a bit of warmth or could it be a sort of solidarity scarf to bring peace. Wishing each of you a peaceful weekend. Off to find a stylish "muffler" to bring a cool calm to my inner zen. 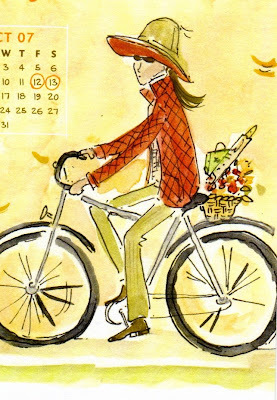 illustration for J.McLaughlin -Fall 07 Mailer "Mark your calendar"
Growing up one of seven, one of my favorite things in the world was riding our bikes or as we would like to say "tearing up the neighborhood." Kentucky for the most part is flat compared to where I live now so it was made for riding horses and bikes. A nice flat terrain with peaks and valleys not hills and dales like here. 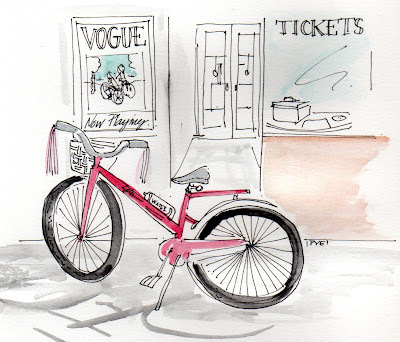 One of my memories was riding to "Roppels" market for a candy bar, or riding to the "Vogue" theatre in St. Matthews to see what was showing. At around 7 years young, I asked my Mom for 10 cents and proceeded to put on my blue flowered parka and rode to Roppels. Coming back, crossing Lexington Road (the busiest street) then coming to the "triangle" and getting into the "waving of, no, you go, back and forth" I finally went and was hit by a car. The man drove me home and after he left, I took off my parka and had to go to the hospital for 13 stitches in my head. My brothers say they are convinced that was the beginning of my bike ride catastrophes. Then in 3rd grade, I had a crush on "Boland" (last name with-held to protect the innocent.) Boland had a "Banana" bike and I wanted in the worst way to ride his bike. So one day he kindly let me and we all were "tearing up the neighborhood" and I did the "stand-up on the pedal" thing and came crashing down on my you know what. (My flower!) Ouch. Went home and back in those days, the Dr. came to my house. Many bike accidents for me, however, I still get back on and ride. I guess we all have our own scars to show. How many of you have bikes and where do you keep them? 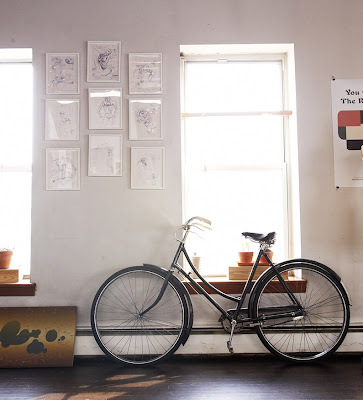 This bike is a city bike, brought inside, like a piece of furniture. 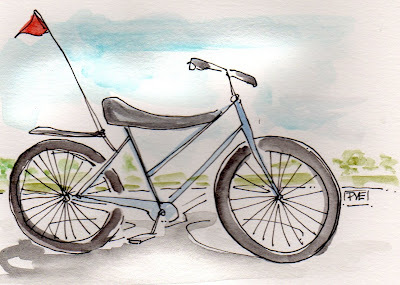 May each of you have an easy weekend, one of bike rides and warm memories.